ROME - Little represents American city life better than the painting—you know it well—of a grimly illuminated diner. In it a lone and lonely man wearing a hat, like the one my father always wore, sits wretchedly on a stool as he nurses a midnight cup of coffee. This is not Italy. Italy is the café, and what is consumed there. For me, this is the Italian cappuccino. Calculating a minimum of 320 daily presences in Italy per year, with one cappuccino at 8 o’clock in the morning and another at 11, in the past six years or so I have sipped, and occasionally spat out, 2,560 cappuccini. To make a proper cappuccino is a tricky business. 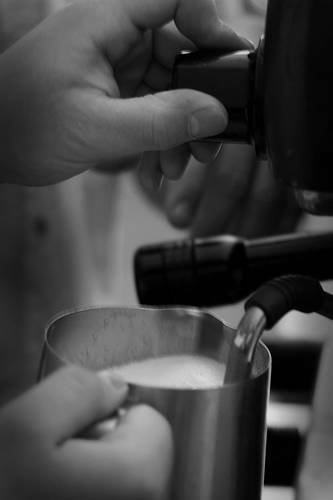 The foam cap must have precisely the right, creamy consistency, for it keeps the cappuccino warm. A foam overdose—where you can actually see bubbles—will cool down the cappuccino. 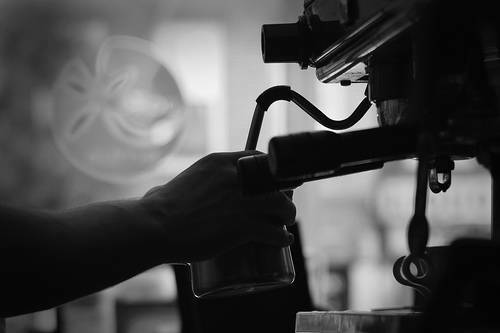 And at any self-respecting café, the barman or woman lets the steamed milk rest a moment, then bangs the metal pan on the counter to remove the unwanted big bubbles. I begin the day with a cornetto as well (alas, increasingly, made from mass-produced frozen dough). A few at the café will dip the cornetto into the cappuccino; in the Sixties a popular Italian version of candid camera TV had an entertainer dip his into the cappuccino of another man, unaware of being filmed. As everyone knows, ordering a cappuccino at the end of a meal, or, heaven forbid, in the middle of the afternoon, is un’americanata, pronounced with a sneeringly nasal “ata” at the end. This refers to a style or action so vulgar that only us Americans will do it. Needless to say, the word is often spoken by an Italian decked out in blue jeans, dock shoes, oxford-cloth button-down and loafers made in Italy. A cappuccino is relished most in the right café. Too much shiny marble is the café equivalent of bling and in certain cases can intimate dodgy ownership, as in money recycling. The bling cafés have their place, but the most interesting cafés come in unexpected places, and are often dark. During my six years of work at the U.S. Embassy, just off Via Veneto in Rome, I would steal away from its august halls to sip a cappuccino in the bleakly serious in-house coffee bar of the Communist-dominated General Confederation of Italian Labor (CGIL), where my Marxist cappuccino was antidote to a certain narrowness of perspective. I have also found hospitable cafés inside hospital lobbies, where patients toss a raincoat or bathrobe over their gowns and stand by the counter to chat with anyone who will listen about their operation or new baby. “Scecherato. (“Shakered,” or coffee-milk in a blender with ice.) And so on. 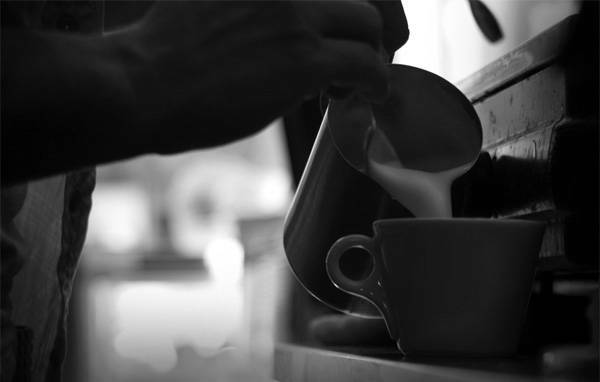 The cappuccino variations begin with whether it is to be served the old-fashioned way, in a glass (nel bicchiere or in vetro), or in a thick pottery cup (in tazza). From there the consumer proceeds to specify how much or little foam is desirable (poco schiuma, senza schiuma). Over the noise the barman in his black cummerbund shouts the order down the counter to his colleague manning the coffee machine, then slams a saucer in front of each customer—larger if for cappuccino, smaller if for caffè—and places a spoon onto the saucer in a specific position: one o’clock, three o’clock, six o’clock. Like the knots in strings made by the Incas, each spoon position tells a story, as I learned when I once absently shifted my spoon and found myself being shouted at. Other conventions must be respected. When a customer requested a glob of whipped cream for his cappuccino in a seaside coffee bar last August, the barman objected. The whipped cream was there and visible, a luscious Mount Everest in a glass bowl. But the barman pointed out that this was high summer, the whipped cream was for gelato cones only, and anyway the morning too hot to think about adding whipped cream to a cappuccino. Instead of stammering a lame apology, the customer said stubbornly that in his cappuccino he liked whipped cream all year round, every day. From the little knot of habitués came snickers. They knew what the barman’s response would be. They watched as, performing for his audience, the barman scornfully filled the cappuccino to the brim and topped it with a giant dollop of whipped cream—filled it until it spilled over, making a brown puddle in the saucer of the poor customer, who had no choice but to drink it all up while ignoring the guffaws, even as dribbles from the cup slopped down the front of his nicely ironed shirt with its fancy label. I sympathized, for as a connoisseur I too have special requirements, which are in fact demands. No matter how hot the temperature outdoors or in, I order my cappuccino bollente (boiling), although many Italians prefer theirs tepid. For the barman to steam the milk until it is hot takes him extra time. He gives in, but sometimes with a grumbled, “Me, I couldn’t drink it that hot.” Occasionally a die-hard fixes me with a spiteful stare that says, “I’ll fix her,” and then makes it as fiery hot as he can—a foretaste of hell. These are the same barmen, needless to say, who ignore their customers to trot out from behind the counter to feed a customer’s dog a tasty morsel from one of the sandwiches behind the glass counter. A special challenge is to get a look, for free, at the morning newspaper. Usually found atop an ice cream freezer, it is usually stained, with the sports pages curled up and scarred brown from others’ beverages. In Rome, the paper is usually Il Messaggero, and getting at it requires ingenuity in the daily battle with the regulars, who want to pour endlessly over the soccer reports. Few tifosi (fans) are about to be put off by a woman, uninterested in sports and a foreigner to boot. The trick, then, is to walk inside, and immediately check to see if the paper is free, then pin it down, set up your beachhead, and, while simultaneously ordering, start reading; otherwise someone else will arrive and grab the paper, and there it goes, for ten minutes you hear nothing but disgust at what la Juve did to la Roma or il Lazio. Still, three days out of four, I get to the newspaper first—though not without a fight. And perhaps that is part of the fun.